Supporters of the C-14 radical group (organization banned in Russia) seized a temple of the Ukrainian Orthodox Church in Chernigov region, TASS reported on January 16. Clergy of the schismatic Orthodox Church of Ukraine (OCU) came to the church together with the members of the group, which is associated with the Svoboda nationalist party. The group forced its way into the church without any documents to sanction this behavior. The attackers arrived in two buses, some carried angle grinders. The police, who the church personnel called, were not eager to interfere with the situation, watching it from outside. According to Metropolitan Kliment of the Ukrainian Orthodox Church, the police had to accept a report about what happened, but no resolution to the situation is expected. Last night, the fence of the Cathedral of the Savior-Transfiguration was desecrated in the Sumy region of Ukraine. 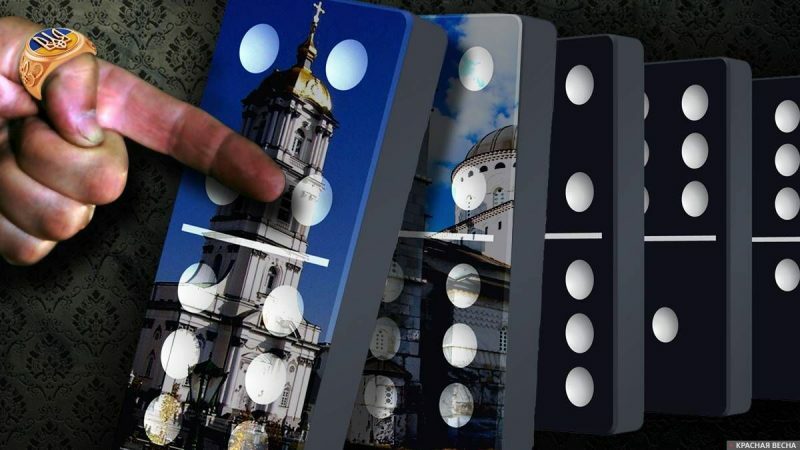 Yesterday, the clergymen of the Kiev-Pechersk Lavra were offered to defect to the schismatic church. Very recently, the Russian Orthodox Church Outside Russia in Canada made a statement that the granting of the Tomos to the OCU was an unlawful act. Also, Vladimir Putin made a statement that Kiev’s actions sowed the seeds of religious animosity. This entry was posted in News from Ukraine and tagged Metaphysical War, Ukraine, Ukrainian Orthodox Church (Moscow Patriarchate). Bookmark the permalink.